Recently I had to take Scruffy back to Brother T's place at "Bear Tower" in Chicago. Braxton, Scruffy's upstairs neighbor, in an email to Scruffy started calling the building they live in "Bear Tower". The building has 34 floors, 300 units. Hmmm, I wonder if a bear census were taken, what the bear to people ratio for that building is? I digress. It was a beautiful day to see the Chicago skyline on the drive down. Here are some of the sights on the drive into the city. of parking decks under the apartments. My brother lives north of them. Mom didn't get a picture of his building. She says she was concentrating on walking the block and a half from the parking spot to the building. Brother T had scouted out a handicapped parking space around the corner, so we got to park for free. Street parking is $2.00 an hour and garage parking is more. Scruffy showed me around the apartment. First he showed me the view from the kitchen. Then he showed me the view from the window near the balcony door. Sure is a long way down as you can see in this next photo. It's a little fuzzy but if you look closely you can see the street way down there. We weren't allowed to go on the balcony, because it is 30 floors up and because it is the Windy City. Neither one of us weighs enough to withstand one of those Chicago wind gusts. That was quite alright with me, just looking out the window made me nervous. Mom and dad said that if you step out on the balcony and lean over the edge so you could peek around the privacy panel between Brother T's balcony and his neighbors you can see Hancock Building. Little known trivia: the John Hancock Building measures 1500 ft. tall, antennas included; equivalent to 1200 Buttons tall. Ahh, there's the lake. It was a beautiful day! If you look directly south you can see the "Big Willy" formerly known as The Sears Tower. The tower is 1707 feet tall, antennas included; equivalent to 1365.6 Buttons tall. How tall am I? It was really cool to see how many of the high rise buildings have rooftop sun decks and swimming pools. We also went upstairs to see Braxton and his buddies, but that will be a special part two posting. It's late and a bear does need his sleep. 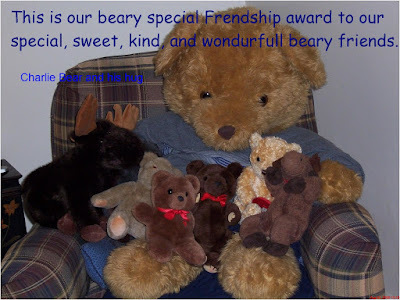 I have a new friend over at Mack & Sally Ann's blog; his name is Charlie Bear. He has graciously awarded me his Teddy Bear Friend Award. He is one great big teddy bear! I think he is bigger than our hugs founding father Daniel James Bear. Here is Daniel James with his wife Alissa Jean, daughter Tricia Jean and her brother Buzzwald (Buzzy) Bear. Charlie says he will be posting on Mack and Sally Ann's blog on Mondays. I know I will be checking in on him and his hug to see what they are up to. Scruffy certainly lives in a impressive looking city and he must have an excellent head for heights too. I could not pear out of that window like he & you did as just too wobbly on my pins! PS - Have you meet Charlie Bear yet? He's over @ Mack & Sally Anns. Oh Buttons, you have a very exciting life. You get to go to Chicago. I love the views from the balcony. Charlie loves you blog. It is one of his favorites. He talks about it all the time. Wow! Cool pics of Chicago, Buttons. Sorry I can't figure out how tall you are...I don't do math. It hurts my head. Gosh I am glad yu dident go owt on the wido ledge! That is a long way up!! THank yu for the emayle abowt the pants. I hav put it on my blog! Wa-hey! I'm usually not afraid of heights, but that's a totally different thing! Wow!